We were hoping that 2016 would not take yet another great from us, but alas, it was not meant to be. Star Wars actress Carrie Fisher has died after suffering a heart attack on Friday. She was 60 years old. Fisher went into cardiac arrest on Friday, December 23 on a flight from London to Los Angeles. She was rushed to the hospital and was previously reported to be in stable condition. Born to actress Debbie Reynolds and singer Eddie Fisher in 1956, Fisher was best known for playing Princess Leia in four Star Wars films, including Star Wars: Episode IV A New Hope in 1977, Star Wars: Episode V The Empire Strikes Back in 1980, Star Wars: Episode VI Return of the Jedi in 1983, and Star Wars: The Force Awakens in 2015. She will also appear in the yet-to-be-named Star Wars: Episode VIII in December of 2017. She’s had roles in such films as Shampoo (1975), The Blues Brothers (1980), Hannah and Her Sisters (1986), The ‘Burbs (1989), and When Harry Met Sally… (1989). Fisher was one of the top script doctors in Hollywood, working on the screenplays of other writers. She did uncredited polishes on movies from 1991 to 2005. Fisher was also known for her semi-autobiographical novels, including Postcards from the Edge, and the screenplay for the film of the same name, as well as her autobiographical one-woman play, and its nonfiction book, Wishful Drinking, based on the show. This year, Fisher released her memoir, The Princess Diarist. 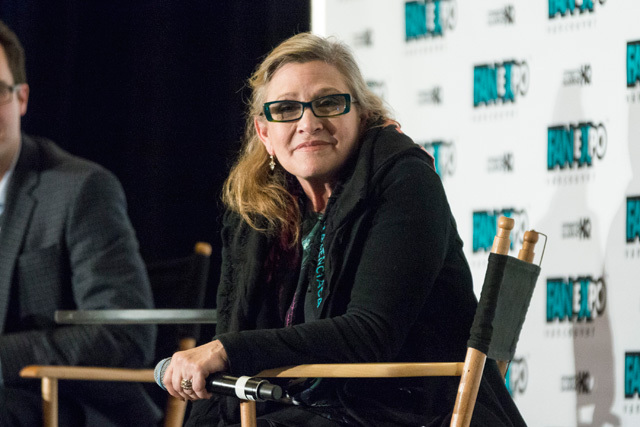 The book is based on diaries she kept while filming the original Star Wars trilogy in the late ’70s and early ’80s. Legendary actress Carrie Fisher passed away today at the age of 60, after suffering a heart attack on Friday, December 23. Fisher was best known to legions of fans as Princess Leia from the Star Wars saga. Fisher, the daughter of Debbie Reynolds and Eddie Fisher, made her film debut in 1975 in Shampoo and two years later starred in the iconic role of Princess Leia, a part that would reshape the way women are portrayed on screen today—including characters such as Rey in Star Wars: The Force Awakens and Jyn in Rogue One: A Star Wars Story. Fisher starred in films such as The Blues Brothers, The Man with One Red Shoe, Hannah and Her Sisters, and When Harry Met Sally. She was also a prolific writer, penning such books as Postcards from the Edge (later turned into film), Delusions of Grandma, Wishful Drinking, and this year’s The Princess Diarist, based on diaries she kept at the time she filmed 1977’s Star Wars: A New Hope. Fisher is survived by Reynolds and her daughter, Billie Lourd. We were deeply saddened to learn of the passing of Carrie Fisher, who in addition to being both a celebrated actor and author, is a cherished member of the Lucasfilm family. She was adored by all who knew her for her endearing personality and delightfully sharp wit. I thought I had got what I wanted under the tree. I didn’t. In spite of so many thoughts and prayers from so many. I am very, very sad.